The pregnancy had been fairly normal. Our greatest fear during those nine months was the thought of raising two children so close in age. If this baby was born on the projected due-date, our first child, Melissa, would only be 13 months old. Our greatest joy during those nine months was bonding with the baby in our special ways. During an ultrasound we discovered we were having a little girl, and so we talked to her by name. "Good morning, Lindsay," we sang. We hoped she would recognize her name at birth. :-) We also composed a lullaby that we often sang to her. We hoped this song would be her comfort-song in the first months of life. I never realized before what a precious time pregnancy is! Oh! Now came the pain again. My eyes return to the clock. How long has it been? How much longer? The time drags. Suddenly, it hit me like a chill. "Something’s wrong with the baby!" The nurses rush to check. "Heart beat is perfect, Mrs. Gensler, just like last time. Now lay back and relax." What's wrong with me? Must choke these stupid thoughts. Okay. Finally. Time for pushing. When she slips into the doctor’s hands my eyes move to the big clock again ~ 8:26, Tuesday night, her birth time. And the room is silent. "Phil?" Terrified, I turn to look into her daddy’s eyes. "It’s okay, Honey," he uttered. "It’s a girl." His voice was at once full of terror and wonder, yet somehow almost reverent. Dear, God, look at her! She’s completely purple! I’ve never had a purple baby before . . . but the doctor must take care of this . . . strange how she just hangs there like that . . . so silent . . . it’s a girl, but she can’t be dead . . . how could any architect design a room like this: so vast and bare and desolate . . . and wonder if anyone noticed the light fixture is askew . . . Oh, gotta call Mama and tell her Lindsay’s here . . . and my brother’s fishing up north . . . someone may have to call him home . . . contact the priest too . . . where are they taking her now . . . all this urgency . . . take it easy now . . . mustn’t have these stupid thoughts . . . maybe if I hold her she’ll come alive . . . come on, baby . . .
And then a miracle. She cried. A glorious, twinkling, newborn cry. I reach out my arms for her, but they rush past me. "Need to check her out in the nursery." Later, the doctor comes to the door. "Your baby is fine," he said brightly, then swiftly disappeared. The baby is fine. Those were just stupid thoughts after all. See? I told you. Babies don’t die! Lindsay weighed 6 lb. 12¾ oz., was 20 inches in length and had a lot of dark hair. Her apgar scores were high (8 and 10), and we were so excited to finally have our new baby here with us. Two hours later, after we were settled in the room, I became impatient so we called the nursery to bring her to our room. "Uh, we can't bring her out just yet," they said. "The doctor will be down to talk with you in a minute." When I heard those words I knew. I KNEW. The pediatrician stepped into our room and said Lindsay was having trouble breathing. When a nurse found her "grunting," her skin a dusky blue, they had moved her into the Special Care Nursery. They were giving her oxygen, monitoring her heart rate and blood gases, doing everything they could, but so far there had been no improvement. He asked if we wanted to see her. It was the first few hours of her life with us. Sometimes full of anticipation and joy; sometimes full of terror and dread; but always full of love. As if in a dream, we entered the special care nursery at 12:15, early Wednesday morning. Lindsay was the only baby there, and I was shocked by her appearance. She seemed to be peacefully sleeping under a dome of oxygen, but her chest jerked violently with each breath. I remember turning my eyes toward the "well-baby nursery", hoping to find my baby there. The denial was working so strong in me I couldn't accept the reality of what was happening. I'm ashamed to admit that I could barely relate to her as the baby I had carried for nine months. Phil, my husband, was so sweet with her: He fell on his knees beside her and ran his hand along her cheek. He smiled and timidly began singing her special lullaby. All through the night her doctor kept us informed of her condition, but each report was worse than the one before. At this point we still didn't know the extent of her illness. An X-ray revealed a suspicious shadow around her lungs so they concluded she either had infant pneumonia or Hyaline Membrane Disease. However, we were reassured by these reports. Both can be cured, and we were optimistic about her full recovery, even when the decision was made to transfer her to Humana Hospital in Louisville, Kentucky, 120 miles away. So it looked like our Lindsay would have to spend an extra week or two in the hospital before we could bring her home. The priest arrived at 5:00 a.m. for the baptism, although we felt this measure was a little too extreme. Lindsay looked so much worse this time. 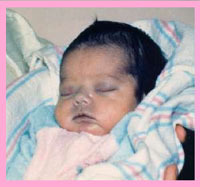 She was now receiving 80% oxygen through an endotracheal tube. Her chest still jerked up and down with each breath; tubes and needles were everywhere. We knelt beside her and removed our wedding rings, which were used to sprinkle holy water onto her forehead. This joyous celebration of baptism was washed with fearful tears. I kept whimpering, "We can do this again later, when we bring her home." At 7:30 a.m., the team of doctors from Louisville brought Lindsay to my room in her little pod. It was the first time we had seen her awake! Her face was beet-red, and she was writhing like a trapped kitten. She was crying, but the breathing tube blocked off all sound. When I softly called her name she instantly quieted and turned her bewildered eyes toward mine. "Poor little Lindsay," I cooed. "Poor, poor little Lindsay." I felt compelled to apologize, to justify, to explain why all the machines were necessary. When I reached my hand through the windows of the isolette, she grasped my finger in newborn reflex (which somehow didn't seem quite so primitive then). Our little girl seemed quite mature and wise beyond her age. I think she even recognized my voice! All day Wednesday, we were optimistic, but each call brought more bad news. They had increased her oxygen levels to 100%, and she had been heavily sedated because she was so "feisty". (That’s my girl!) Around 8:15 that night, we received the phone call: Lindsay had gone into cardiac arrest . . . not once, but twice. They had been able to resuscitate her, but now asked our permission to move her to Kosair Children’s Hospital. More intensive testing needed to be done . . . her problems were beginning to look cardiac. At 9:30 p.m., they called again: "Most hearts have four chambers. Your daughter's heart has only three. I'm sorry, but there is nothing we can do." As I wrote the words, "Hypoplastic Left Heart Syndrome," I tried to hide them from the nurse who was in the room with me. I thought if I kept it secret, nobody would ever have to know my baby was so sick. Surely it wasn’t as serious as they made it sound. It felt like someone had rammed a knife into my heart or run over me with a steam-roller. They told us to get up to Kosair Hospital as soon as possible because they couldn't guarantee she would live through the night. And what a long night it turned out to be . . .